I have read many books on the War of 1812 and now have a tendency to only read those that focus on a specific aspect of the war. Battle for the Bay does that very well for me. It is the only book that I am aware of that focuses on the action off the New Brunswick coast in the Bay of Fundy. "As the 200th anniversary of the War of 1812 approaches, a chapter in the history of the war is being opened for the first time. Although naval battles raged on the Great Lakes, combat between privateers and small government vessels also boiled in the Bay of Fundy and the Gulf of Maine. 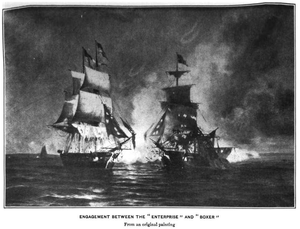 Three small warships played a vital role in defending the eastern waters of British North America in this crucial war. The crews of these hardy ships fought both the Americans and the elements — winter winds, summer fog, and the fierce tidal currents of the Bay of Fundy — enduring the all-too-real threats of shipwreck and possible capture and imprisonment. Now, for the first time, Joshua M. Smith tells the full story of the battle for the bay." I did not know that New Brunswick was important to great Britain in their war with France. It seems that was where Britain imported the large trees needed for it's navy's ship masts. Even Nelson's famous HMS Victory, used New Brunswick trees for it's masts. The book describes the style of the Naval warfare used in the Bay of Fundy called Guerre de course (Commerce Raiding) where instead of attacking the enemy directly, you instead attack the enemy's commercial shipping while protecting your own. It follows the action of 3 British ships in the conflict, the Provincial sloop Brunswicker, His Majesty's schooner Bream, and His Majesty's brig Boxer. I found it a very interesting that it was written from the Canadian point of view but by an American writer Joshua Smith. He is an expert on maritime history of Maine and New Brunswick and has written a couple of books about smuggling between the Us and Canada during that period of time. 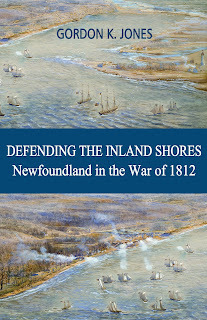 Battle for the Bay is the 17th book which comprises The New Brunswick Military History series. The series contacted Mr Smith to write this book. It is a short book, only 110 pages long but definitely worth reading. Sounds both interesing and enlightening, thanks for the great review!